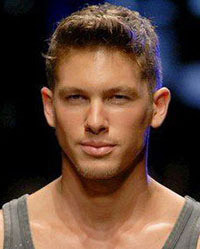 Adam Senn was born in Paris, France, on April 10, 1984, is an American male model and actor. He was raised in Sugar Land, Texas. Adam was discovered by model scout from modeling agency ReQuest Models. Become the face of Dolce and Gabbana Sport in 2012. He is avid baseball and soccer player. He was a nationally ranked Amateur golfer. He dated Lindsay Lohan (2009-2010) and Allie Crandell (2008-2009). He has been in relationship with singer Madonna in 2010. Lives in New York City, he owns a restaurant Bocca di Bacco, on 7th Avenue in New York City. He made his big screen debut in drama film Magic City Memoirs (2011) in role as Charles. He played bisexual basketball player Zero in VH1's sports drama television series Hit the Floor (2014-2016). DA MAN Magazine Cover, GQ Australia, GQ Italia, Vogue Hombre, Dolce & Gabbana Men Lookbook, DSECTION Magazine, Panorama Icon Magazine, GQ Germany, Antidote, Elle Men Mexico, Interview Magazine. Beymen Club, Dolce & Gabbana, Banana Republic, Express, Mavi, Zadig & Voltaire, Ugg, Strellson, Siviglia. Walked runway for amfAR, Dolce & Gabbana and Viktor & Rolf. Represented by agencies New York IMG, Paris New Madison, Milan Why Not Model Management, London Select Model Management. I had movie night every Friday at my house since I was born. I will always have a apartment in NY but my heart still lies in Texas! I co-own a restaurant and it does well. Thankfully it’s been around long enough so I don’t have to be there but I’ve always had a passion for food. That’s really the reason why I became an actor because I enjoy so many other professions and being an actor you get to explore all these different professions.